"Grace Got You" Feat. John Reuben Impacts Radio Mar. 2 On Heels Of Unparalleled Hit "Even If"
The official music video was just released for the much-anticipated new movie, “I Can Only Imagine,” a true story based on the life of MercyMe lead singer, Bart Millard who wrote the mega-hit song “I Can Only Imagine” after the loss of his father to cancer. "I Can Only Imagine" is a gripping reminder of the power of forgiveness and beautifully illustrates that no one is ever too far from second chances. 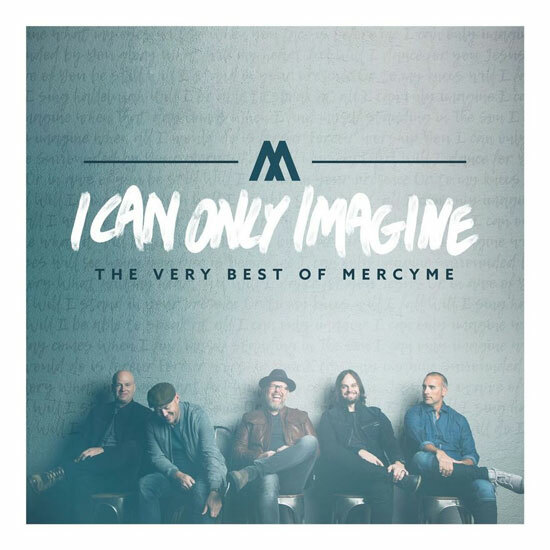 In conjunction with the new film, MercyMe has recorded “I Can Only Imagine (The Movie Session).” The new track is available for download and streaming today alongside a digital preorder for the upcoming album. Follow the links below to start listening now. “I Can Only Imagine (The Movie Session)" is available today on iTunes, Apple Music, Spotify, Amazon and the Official Movie Site. Watch the vertical music video on Spotify here. “Grace Got You” Feat. John Reuben will be released to radio nationwide on Mar. 2. This marks the second single to impact radio from the multi-platinum selling band’s latest GRAMMY® nominated, chart-topping album Lifer, preceded by “Even If” which had an unprecedented 19 week run at No. 1. “‘Grace Got You’ is just a song that makes me smile," adds Millard. "The whole idea that once you realize God’s grace has you no matter what comes your way, you can live your life as if you’ve already read the last page of the book and know how the whole thing turns out. Our eternity is set! On your worst day, Christ is OK with you. He adores you. He’s pleased with you. How is that possible? No clue, but it is. That’s the most amazing news of all!” Stream or download “Grace Got You” today on Apple Music, iTunes, Spotify and Amazon Music. Kicking off this month, The "MercyMe Live" Tour will unite the band with Tenth Avenue North alongside Tim Timmons for a three month stretch. The line-up will visit over 20 markets including Dallas, Nashville, Minneapolis, Atlanta and more. For the latest information on MercyMe, visit www.MercyMe.org. Since their debut in 2001, GRAMMY® nominated, multiple American Music Award and Dove Award winners MercyMe have sold more than 9 million units in CD, single and DVD sales, garnered more than 57 No. 1 multi-format radio singles and four consecutive mainstream radio hits with “I Can Only Imagine,” (No. 4 AC/Top 25 on Top 40/Hot AC), “Here With Me” (No. 4 AC), “Homesick” (Top 10 AC) and “So Long Self.” MercyMe made history in 2014 as “I Can Only Imagine” surpassed 2 million digital downloads, making it the first song in Christian music to go platinum and double-platinum in the digital domain. The album containing the hit, Almost There, recently received triple platinum certification from the RIAA. In 2009, Billboard named MercyMe's "Word Of God Speak" the No. 1 Song of The Decade and the group the No. 1 Artist of the Decade in both the Christian Songs and Christian AC Songs categories, recognizing them as one of the industry's most notable talents. They have sold out venues throughout the US and Canada, including Radio City Music Hall, and have appeared on the Macy’s Thanksgiving Day Parade, The Today Show, CBS This Morning, The Tonight Show with Jay Leno, FOX New Channel's FOX & Friends, CNN, ABC News and in the pages of Entertainment Weekly, The New York Times, USA Today and more. MercyMe’s eighth studio album, Welcome To The New, garnered two GRAMMY® nods, four radio hits, has been certified gold by the RIAA and continues to be a top selling title. LIFER, their latest chart-topping, GMA Dove Award winning and GRAMMY® nominated album, includes the RIAA certified gold, smash hit "Even If” which dominated the Billboard and Mediabase radio charts with a 19-week streak at No. 1 and earned a GRAMMY® nomination.